Tonight marked my 3rd attempt at a convection-oven baked version of Taiwanese chicken nuggets (鹽酥雞). It's a slightly different recipe that I found online (plus my own changes), and in my second attempt, I added eggs as a test, and also tried some with a batter. As I expected, batters don't work well with the convection oven, as they mostly dripped away (like the fat from the bacon). Aside from that, the eggs created a texture I didn't particularly like (probably would have worked better fried). This third try turned out pretty well. Create marinade mixing soy sauce, rice wine, minced garlic, 5-spice powder, sugar, black pepper, salt, sesame oil, and basil leaves. 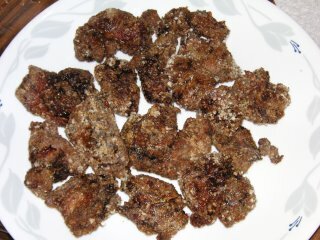 Cut the chicken into bitesize pieces, and marinate for at least 2 hours (I let it marinate overnight). Brush grills with olive oil or spray non-stick cooking spray. Bake in convection oven for 30 minutes at 400°F, turning over halfway through. If, after 20 minutes, any of the sweet potato powder are still white, brush with some olive oil to get them to "cook." Sprinkle ground white pepper over the nuggets, and serve.